The Sony Bravia XD93 will change the way you watch TV forever. Ultra HD resolution, HDR technology, and Android TV give you access to a mountain of content, all in stunning detail. Looking for a smaller size? This model is also available with a 55” screen. 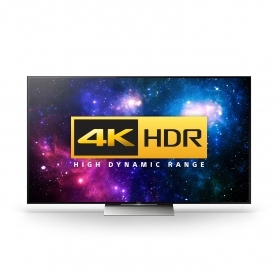 The 4K Ultra HD resolution combined with High Dynamic Range technology delivers richer colours, brighter whites, and deeper, darker blacks than ever before. With four times the resolution of full HD, 4K packs in over eight million pixels on your screen. This results in breathtakingly detailed images, which deliver a more immersive experience than full HD TVs. The 4K Processor X1 ensures stunning picture quality no matter what you’re watching, whether that’s the latest blockbuster or an old classic, the 4K processor will enhance the picture to near 4K resolution. The Sony KD65XD9305BU is the perfect TV to take full advantage of HDR video; it will be the biggest change to your viewing experience since the move from standard definition to HD. HDR content allows for a larger range of brighter colours, and, combined with greater contrasts, will deliver the most true-to-life video to date. With popular streaming services already creating HDR content, you’ll be able to fully immerse yourself in all the latest TV shows. 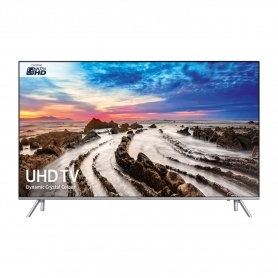 Not only does this TV use the latest technology to give you the best picture possible, but it’s also been designed to look stunning in your home, coming in a sleek black finish. At its thickest point, the TV is just 3.6 cm deep, with the actual screen depth only 1.17 cm. The screen has a flush finish, with no raised bezel for a near invisible edge, and the cable management system conceals any loose wires behind a panel. A Silver Slate stand is included if you want to place your TV on a unit, while the wall mount also allows you to hang the KD65XD9305BU flat against the wall. Android TV gives you access to thousands of films, games, songs, and more on your TV, from Google Play, YouTube, and a huge variety of other apps. Netflix and BBC iPlayer will let you catch up with your favourite films or box sets, while news apps such as BBC News and BBC Sport will keep you up-to-date with world affairs. This Sony LED TV is Google Cast Ready too, which allows you to send your content and apps between the TV and your devices - be it Android, iOS, Windows, Mac, or Chromebook. With four HDMI connections, one SCART connection, and three USB ports, you’ll have no problem turning the KD65XD9305BU into an entertainment hub for your house. Enhance your entertainment experiences with the stunning Sony KD65XD9305BU 4K HDR TV. Buy yours today.